Eastern Tool mills are setting new standards in both features and performance. Our variable frequency drive mill is the highest performing mill in its class. These VFD mills run on 3-phase or 1-phase power without modification. Use it in the professional shop or home garage. No phase converter is required for single phase power. Large digital spindle RPM display and real time spindle load meter make using the mill easy and precise. With power to go from 0-4500 rpm in under 3 seconds, our milling machines can take your productivity to the next level. Our Bed Mills offer more rigidity and travel, high-production capacity, and phenomenal speed and accuracy. 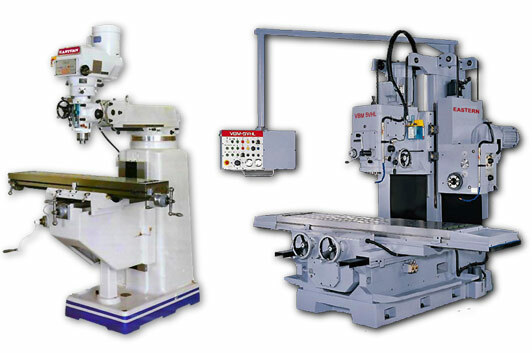 They are engineered for virtually every industry application from R&D vertical machining to production shops and are the perfect choice if you need to take heavy cuts such as making mold bases. Eastern Tool box way bed mills come with table travels of 32″ x 18″ x 18″ to 78″ x 35″ x 28″. Linear guideways VMCs come with table travels of 24″ x 18″ x 18″ to 40″ x 20″ x 20″. Designed for high-precision, high-volume production and repetitive manufacture of the same part, our Knee Mills are built to last on heavy-duty, solid foundations. They promise accurate alignment and flawless surface finish performance for every application. Eastern Tool Knee Mills come factory installed with Acu-Rite MillPwr G2 controls. Table sizes range from 9″ x 49″ to 12″ x 50″, while table travels range from 12″ x 28″ to 17″ x 30″.